When it comes to clients under age 30, it is often the case that the generic income chart shows income level that should receive the premium tax credit subsidy. In many cases they do not receive subsidy--even with income in the 300-400% range. This creates some confusion and an understanding of the "benchmark" used in this calculation. The benchmark plan is the second lowest cost Silver plan in any rating area. Subsidy eligibility is strictly based upon the premium cost of the benchmark plan. Single Age 27, Los Angeles, MAGI (modified adjusted gross income) $34,000. This is generally found on line 37 form 1040. According to the income chart (see below), that income should qualify for the premium tax credit subsidy. In this case however, due to the low premium of the benchmark plan in the LA rating area, no subsidy is allowed. Premium tax credit subsidy is designed to reduce the total annual premium for health insurance to not more than 9.69% of the MAGI. This is considered "affordable" by the government and indexes every year. 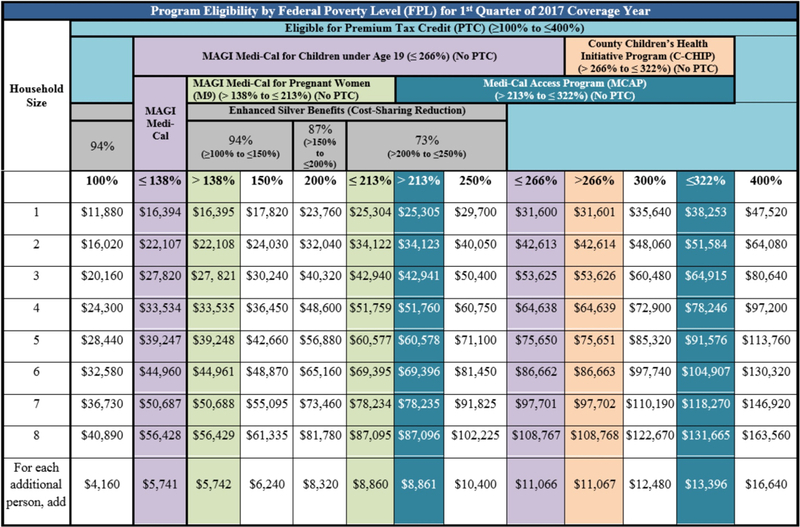 So, in this case, even though the income for this individual falls into a premium tax credit subsidy range according to the Covered CA income chart, because the premium for the benchmark second lowest cost Silver plan is so low, any MAGI at or greater than $32,321.98 would not receive subsidy.